Edward Lansdale was born in Detroit, Michigan, on 6th February, 1908. During the Second World War Lansdale was a member of the Office of Strategic Services (OSS), an organization that was given the responsible for espionage and for helping the resistance movement in Europe. According to Sterling Seagrave, Lansdale was sent by General Charles Willoughby to the Philippines after the war. Lansdale "joined the torture sessions of Major Kojima Kashii "as an observer and participant". As Seagrave explains: "Since Yamashita had arrived from Manchuria in October 1944 to take over the defense of the Philippines, Kojima had driven him everywhere." In charge of Kojima’s torture was an intelligence officer named Severino Garcia Diaz Santa Romana (Santy). He wanted Major Kojima to reveal each place to which he had taken General Tomoyuki Yamashita, where bullion and other treasure were hidden." Ray Cline argues that between 1945 and 1947 the gold bullion recovered by Santy and Lansdale was moved by ship to 176 accounts at banks in 42 countries. Robert Anderson and CIA agent Paul Helliwell set up these black gold accounts "providing money for political action funds throughout the noncommunist world." Promoted to the rank of major Lansdale was appointed Chief of the Intelligence Division in the Philippines. His main task was to rebuild the country's security services. On his return to the United States in 1948 Lansdale became a lecturer at the Strategic Intelligence School in Colorado. However, in 1950, Elpidio Quirino, the president of the Philippines, requested Lansdale's help in his fight against the communist insurrection taking place in his country. In the early 1950s, Allen Dulles gave Lansdale $5-million to finance CIA operations against the Hukbalahap movement, the rural peasant farmers fighting for land-reform in the Philippines. According to Sterling Seagrave Lansdale "was in and out of Tokyo on secret missions with a hand-picked team of Filipino assassins, assassinating leftists, liberals and progressives." CIA Director William Colby later commented: "Lansdale helped and perhaps created the best president the Philippines ever had...turned American policy away from support of French colonial rule in Vietnam to support of a non-Communist nationalist leader...he preached for Americans to support those willing to fight for themselves... He was one of the greatest spies in history... the stuff of legends." In 1953 Lansdale was sent to Vietnam to advise the French in their struggle with the Vietminh. Dulles told President Dwight Eisenhower that he was sending one of his “best men”. The following year Lansdale and a team of twelve intelligence agents were sent to Saigon. The plan was to mount a propaganda campaign to persuade the Vietnamese people in the south not to vote for the communists in the forthcoming elections. In the months that followed they distributed targeted documents that claimed the Vietminh and Chinese communists had entered South Vietnam and were killing innocent civilians. The Ho Chi Minh government was also accused of slaying thousands of political opponents in North Vietnam. Colonel Lansdale also recruited mercenaries from the Philippines to carry out acts of sabotage in North Vietnam. This was unsuccessful and most of the mercenaries were arrested and put on trial in Hanoi. Finally, Lansdale set about training the South Vietnamese army (ARVN) in modem fighting methods. For it was coming clear that it was only a matter of time before the communists would resort to open warfare. Graham Greene was furious with Mankiewicz’s treatment ofhis novel. "Far was it from my mind, when I wrote The Quiet American that the book would become a source of spiritual profit to one of the most corrupt governments in Southeast Asia." In October, 1955, the South Vietnamese people were asked to choose between Bo Dai, the former Emperor of Vietnam, and Ngo Dinh Diem for the leadership of the country. Lansdale suggested that Diem should provide two ballot papers, red for Diem and green for Bao Dai. Lansdale hoped that the Vietnamese belief that red signified good luck whilst green indicated bad fortune, would help influence the result. After the election Ngo Dinh Diem informed his American advisers that he had achieved 98.2 per cent of the vote. Lansdale warned him that these figures would not be believed and suggested that he published a figure of around 70 per cent. Diem refused and as the Americans predicted, the election undermined his authority. Another task of Lansdale and his team was to promote the success of the rule of President Ngo Dinh Diem. Figures were produced that indicated that South Vietnam was undergoing an economic miracle. With the employment of $250 millions of aid per year from the United States and the clever manipulating of statistics, it was reported that economic production had increased dramatically. Lansdale left Vietnam in 1957 and officially went to work for the Secretary of Defence in Washington. However, he was also employed as a senior officer in the Central Intelligence Agency. Posts held included: Deputy Assistant Secretary for Special Operations (1957-59), Staff Member of the President's Committee on Military Assistance (1959-61). In March 1960, President Dwight Eisenhower of the United States approved a CIA plan to overthrow Fidel Castro. The plan involved a budget of $13 million to train "a paramilitary force outside Cuba for guerrilla action." When President John F. Kennedy took office, Lansdale was appointed as Assistant Secretary of Defence for Special Operations. He argued that the CIA should work closely with exiles in Cuba, particularly those with middle-class professions, who had opposed Fulgencio Batista and had then become disillusioned with Fidel Castro because of his betrayal of the democratic process. Lansdale was also opposed to the Bay of Pigs operation because he knew that it would not trigger a popular uprising against Castro. Kennedy respected the advice of Lansdale and selected him to become project leader of Operation Mongoose. Over 400 CIA officers were employed full-time on this project. Sidney Gottlieb of the CIA Technical Services Division was asked to come up with proposals that would undermine Castro's popularity with the Cuban people. Plans included a scheme to spray a television studio in which he was about to appear with an hallucinogenic drug and contaminating his shoes with thallium which they believed would cause the hair in his beard to fall out. These schemes were rejected and instead Richard Bissell decided to arrange the assassination of Fidel Castro. In September 1960, Bissell and Allen W. Dulles, the director of the Central Intelligence Agency (CIA), initiated talks with two leading figures of the Mafia, Johnny Roselli and Sam Giancana. Later, other crime bosses such as Carlos Marcello, Santos Trafficante and Meyer Lansky became involved in this plot against Castro. Lansdale later claimed that John F. Kennedy asked him to draft a contingency plan to overthrow Fidel Castro. But he added that the idea had not been viable because it depended on recruiting Cuban exiles to generate an uprising in Cuba, something that he said was impossible. In 1963 Kennedy asked Lansdale to concentrate on the situation in Vietnam. However, it was not long before Lansdale was in conflict with General Maxwell Taylor, who was the military representative to the president. Taylor took the view that the war could be won by military power. He argued in the summer of 1963 that 40,000 US troops could clean up the Vietminh threat in Vietnam and another 120,000 would be sufficient to cope with any possible North Vietnamese or Chinese intervention. Lansdale disagreed with this viewpoint. He had spent years studying the way Mao Zedong had taken power in China. He often quoted Mao of telling his guerrillas: "Buy and sell fairly. Return everything borrowed. Indemnify everything damaged. Do not bathe in view of women. Do not rob personal belongings of captives." The purpose of such rules, according to Mao, was to create a good relationship between the army and its people. This was a strategy that had been adopted by the National Liberation Front. Lansdale believed that the US Army should adopt a similar approach. As Cecil B. Currey, the author of Edward Lansdale: The Unquiet American pointed out: "Lansdale was a dedicated anticommunist, conservative in his thoughts. Many people of like persuasion were neither as willing to study their enemy nor as open to adopting communist ideas to use a countervailing force. If for no other reason, the fact makes Lansdale stand out in bold relief to the majority of fellow military men who struggled on behalf of America in those intense years of the cold war." Lansdale also argued against the overthrow of Ngo Dinh Diem. He told Robert McNamara that: "There's a constitution in place… Please don't destroy that when you're trying to change the government. Remember there's a vice president (Nguyen Ngoc Tho) who's been elected and is now holding office. If anything happens to the president, he should replace him. Try to keep something sustained." It was these views that got him removed from office. The pressure to remove Lansdale came from General Curtis LeMay and General Victor Krulak and other senior members of the military. As a result it was decided to abolish his post as assistant to the secretary of defence. He was awarded the Distinguished Service Medal for counter-insurgency work and became consultant to the the Food for Peace programme. 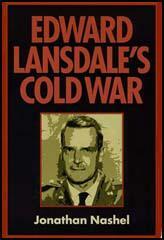 Lansdale continued to argue against Lyndon Johnson's decision to try and use military power to win the Vietnam War. When General William Westmoreland argued that: "We're going to out-guerrilla the guerrilla and out-ambush the ambush… because we're smarter, we have greater mobility and fire-power, we have more endurance and more to fight for… And we've got more guts." Lansdale replied: "All actions in the war should be devised to attract and then make firm the allegiance of the people." He added "we label our fight as helping the Vietnamese maintain their freedom" but when "we bomb their villages, with horrendous collateral damage in terms of both civilian property and lives… it might well provoke a man of good will to ask, just what freedom of what Vietnamese are we helping to maintain?" Lansdale quoted Robert Taber (The War of the Flea): "There is only one means of defeating an insurgent people who will not surrender, and that is extermination. There is only one way to control a territory that harbours resistance, and that is to turn it into a desert. Where these means cannot, for whatever reason, be used, the war is lost." Lansdale thought this was the situation in Vietnam and wrote to a friend that if the solution was to "kill every last person in the enemy ranks" then he was "not only morally opposed" to this strategy but knew it was "humanly impossible". Lansdale added "No idea can be bombed or beaten to death. Military action alone is never enough." He pointed out that since 1945 the Vietminh had been willing to fight against the strength of both France and the United States in order to ensure success of their own. "Without a better idea, rebels will eventually win, for ideas are defeated only by better ideas." Lansdale was anti-communist because he really believed in democracy. Lansdale had been arguing since 1956 that the best way of dealing with the National Liberation Front was to introduce free elections that included the rights of Chams, Khmers, Montagnards and other minorities to participate in voting. Lansdale said that he went into Vietnam as Tom Paine would have done. He was found of quoting Paine as saying: "Where liberty dwells not, there is my country." He also distanced himself from the Freedom Studies Center of the Institute for American Strategy when he discovered it was being run by the John Birch Society. He told a friend: "I refused to have anything more to do with it… That isn't what our country is all about." Lansdale considered himself a "conservative moderate" who was tolerant of all minorities. Lansdale continued to advocate a non-military solution to Vietnam and in 1965, under orders from President Lyndon B. Johnson, the new US ambassador in Saigon, Henry Cabot Lodge, put Lansdale in charge of the "pacification program" in the country. As Newsweek reported: " Lansdale is expected to push hard for a greater effort on the political and economic fronts of the war, while opposing the recent trend bombing and the burning of villages." One of those who served under him in this job was Daniel Ellsberg. He liked Lansdale because of his commitment to democracy. Ellsberg also agreed with Lansdale that the pacification program should be run by the Vietnamese. He argued that unless it was a Vietnam project it would never work. Lansdale knew that there was a deep xenophobia among Vietnamese. However, as he pointed out, he believed "Lyndon Johnson would have been just as xenophobic if Canadians or British or the French moved in force into the United States and took charge of his dreams for a great Society, told him what to do, and spread out by thousands throughout the nation to see that it got done." In February 1966 Lansdale was removed from his position in control of the pacification program. However, instead of giving the job to a Vietnamese, William Porter, was given the post. Lansdale was now appointed as a senior liaison officer, with no specific responsibilities. Unlike most Americans in Vietnam, Lansdale believed it was essential for Vietnamese leaders to claim credit for any changes and reforms. His attitude aroused antagonism in the hearts of many within the U.S. bureaucracy who didn't like the idea of allowing others to receive credit for successful programs – although they did not object to blaming Vietnamese leaders for projects that failed. Most importantly, Lansdale thought that the military should be careful to avoid causing civilian casualties. As his biographer, Cecil B. Currey pointed out: " Lansdale was primarily concerned about the welfare of people. Such a stance made him anathema to those more concerned about search and destroy missions, agent orange, free fire zones, harassing and interdicting fires, and body counts." According to Lansdale "we lost the war at the Tet offensive". The reason for this was that after this defeat American commanders lost the ability to discriminate between friend and foe. All Vietnamese were now "gooks". Lansdale complained that commanders resorted more and more on artillery barrages that killed thousands of civilians. He told a friend that: "I don't believe this is a government that can win the hearts and minds of the people." Lansdale resigned and returned to the United States in June 1968. Edward Lansdale died in McLean, Virginia, on 23rd February, 1987. Lansdale was a dedicated anticommunist, conservative in his thoughts. Many people of like persuasion were neither as willing to study their enemy nor as open to adopting communist ideas to use a countervailing force. If for no other reason, the fact makes Lansdale stand out in bold relief to the majority of fellow military men who struggled on behalf of America in those intense years of the cold war. Graham Greene once told someone that he definitely did not have me in mind when he created the character Alden Pyle. I sure hope not... On the other hand Pyle was close to Trinh Minh Thé, the guerrilla leader, and also had a dog that went with him everywhere - and I was the only American close to Trinh Minh Thé and my poodle Pierre went everything with me." In August 1962, SGA brought intelligence collection to an end. On 10 August, members of SGA met in the office of Dean Rusk, the secretary of state. Others who gathered that day included McNamara, John A. McCone, CIA; Edward R. Murrow, director of USIA; McGeorge Bundy, Kennedy's national security adviser; Edward Lansdale; and others. They met to decide on the next phase of Mongoose. Lansdale suggested they now enter Course B, a plan to "exert all possible diplomatic, economic, psychological and other overt pressures to overthrow the Castro-communist regime, without overt employment of U.S. military." Lansdale told his fellow SGA members, "We want boom and bang on the island. Those present that day also discussed assassinating Castro. Given the Kennedys' fixation on getting rid of him and the activities of Harvey's Task Force W, it is difficult to believe that no such conversations occurred earlier. But that day is the first for which specific evidence exists. John McCone later recalled that it was one of the topics, although he claimed that he personally opposed any such action. He thought it may have been McNamara who brought it up, although the secretary of defense later claimed he could not recall any talk of assassination. Walter Elder, McCone's executive assistant, was in his boss's office when McCone telephoned McNamara shortly after the meeting broke up. Elder remembered that McCone told McNamara that "the subject you just brought up. I think it is highly improper. I do not think it should be discussed. It is not an action that should ever be condoned. It is not proper for us to discuss and I intend to have it expunged from the record." Not knowing McCone's reluctance to have anything left on paper, Lansdale prepared an action memorandum, dated 13 August, which called for the preparation of contingency plans for "Intelligence, Political (including liquidation of leaders), Economic (sabotage, limited deception) and Paramilitary. " He sent copies to William Harvey, to the State Department's Robert Hurwith, to General Benjamin Harris of the Defense Department, and to Donald Wilson, USIA. Thirteen years later, the Church Committee of the United States Senate gave a long, hard look at allegations that the government of this country had been involved in various assassination attempts on leaders in other nations. The principals who were involved in Mongoose were called upon to give testimony. There was suddenly a veritable implosion of recall and memory. Few could remember anything pertinent, and those who did could do so only vaguely and with uncertainty. William Harvey had died by that time so it was acceptable to remember his efforts at planning Castro's assassination. When asked if Harvey kept him advised of what he was doing - the CIA man mounted at least eight different attempts on Castro's life - Lansdale insisted he never knew any details. "It would," he recalled, "have been highly unusual for me to know." Lansdale testified before the Church Committee that "I had no knowledge of such a thing. I know of no order or permission for such a thing and I was given no information at all that such a thing was going on by people who I have now learned were involved with it." As a matter of fact, it would have been "highly unusual" had he not known what was planned, given his grasp of detail, his tight control over Task Force W, and his insistence on staying on top of current activity. Yet when grilled by the Church Committee, Lansdale insisted that when the subject was raised on 10 August, "the consensus was ... hell no on this and there was a very violent reaction." If that was the decision at the 10 August meeting, why then had Lansdale gone ahead to call for "liquidation" of Cuban leaders? He testified that "I thought it would be a possibility someplace down the road in which there would be some possible need to take action such as that [assassination]." His position was simple and straightforward. Every means should be explored for removing the threat posed by Fidel Castro. For that reason he instructed Harvey to develop contingency plans in order to learn if the United States had the capability for "wet" actions. Why had he circulated his memorandum? Lansdale waffled. "I don't recall that thoroughly. I don't remember the reasons why I would." Was it not his understanding that assassination efforts had already been vetoed at the 10 August meeting? "I guess it is, yes," the general replied. "The way you put it to me now has me baffled about why I did it. I don't know." Lansdale added another disclaimer in his plea of innocence. Although he "had doubts" that assassination was a "useful action, and [was] one I had never employed in the past, during work in coping with revolutions, and I had considerable doubts as to its utility ... I was trying to be very pragmatic." As a good soldier, he admitted that any responsibility must have been his own. General Benjamin Harris was a little more open. He testified that such activities are "not out of the ordinary in terms of contingency planning... it's one of the things you look at." Harris was correct. It was not shameful for the Special Group Augmented to look into the possibility of assassination. In a committee composed of members of the highest level of government, it would rather be shameful had they not explored the subject, assigned as they were to promote the destabilization of Cuba. Whether destabilization itself was a proper subject for American attention is an altogether different question that could be fruitfully considered. That was not, however, the assignment given those men during 1962 by the American president! When Harvey received Lansdale's memorandum, his first thought was of the danger of leaving such records for future investigative committees. He immediately called Lansdale's office and pointed out "the inadmissibility and stupidity of putting this type of comment in writing in such documents." He further added that CIA "would write no document pertaining to this and would participate in no open meeting discussing it." On 14 August, Harvey wrote Helms stating that although Secretary McNamara had brought up the topic of assassination and Lansdale had written a memorandum about it, liquidation of foreign leaders was not an appropriate subject for inclusion in official records and he further insisted the offending words be deleted from both Lansdale's memorandum and any minutes of the meeting. Lansdale later recalled only one additional contact with Harvey. He had one brief conversation with the CIA agent after the 10 August meeting. At that time Harvey stated "he would look into it [the assassination of Castro and] see about developing some plans." That, Lansdale insisted, was the last he ever heard about assassinations. The French saw their mission civilatrice as bringing French culture, language, and history to the world. The British saw themselves as conferring the gift of administration, law, and order. Lansdale ... was pretty much an imperialist in the mold of the British except in his case... it was [to bring] democracy. He did think it was in the interest of the people he was working with, the Filipinos, the Vietnamese. At the same time he believed it was very much in their interest to be within the sphere of American influence... that our interest was to be served... by fostering a kind of nationalism and a relative independence which, however, would need American aid and influence but would be independent. It was a way of extending and ensuring a sphere of American influence for the good of America but also for the good of (other) people and against communism, which he despised. In the latest issue of Steam Shovel Press in an article by photo analyst Jack White, L. Fletcher Prouty describes one of several known Tramp photos. This particular photo shows the tramps being escorted along a service entrance to the TSBD wall comprised of two high chain-link gates with large diamond-shapes in the center of each. The tramps are facing the camera and a man is seen walking in the opposite direction, back to the camera. Prouty believes that the man walking away from the camera is Edward Lansdale. Lansdale, a planner with the Air Force Directorate and then the CIA-affiliated Office of Special Operations, worked closely with E. Howard Hunt. Lansdale's specialty, according to Prouty, who claims to have also worked closely with him, was staging real-time covers, diversions, and the general "smoke screens" under which assassinations took place. When asked to explain, Prouty alleges that it was Lansdale's job to provide "actors", and "screenplays" for certain black operations deployed by the covert operatives. I continue to be surprised to find Fletcher Prouty quoted as an authority. He was my "cross to bear" before Dan Ellsberg came along. Fletch is the one who blandly told the London Times that I'd invented the Huk Rebellion, hired a few actors in Manila, bussed them out to Pampanga, and staged the whole thing as press agentry to get RM (Magsaysay) elected. He was a good pilot of prop-driven aircraft, but had such a heavy dose of paranoia about CIA when he was on my staff that I kicked him back to the Air Force. He was one of those who thought I was secretly running the Agency from the Pentagon, despite all the proof otherwise. Edward G. Lansdale, an Air Force officer whose influential theories of counterinsurgent warfare proved successful in the Philippines after World War II but failed to bring victory in South Vietnam, died yesterday at his home in McLean, Va. He was 79 years old and had a heart ailment. A dashing Californian, Mr. Lansdale is widely thought to have been the model for characters in two novels involving guerrilla warfare in Southeast Asia: ''The Quiet American'' by Graham Greene and ''The Ugly American'' by Eugene Burdick and William J. Lederer. He retired from the Air Force as a major general in 1963. As an adviser in the newly independent Philippines in the late 1940's and early 1950's the future general came to wield great influence in operations by the Philippine leader Ramon Magsaysay against the Communist-dominated Hukbalahap rebellion. Under the leadership of Mr. Magsaysay, who was elected President while the struggle was going on, the operations succeeded. It was in the Philippines that General Lansdale framed his basic theory, that Communist revolution was best confronted by democratic revolution. He came to advocate a four-sided campaign, with social, economic and political aspects as well as purely military operations. He put much emphasis on what came to be called civic-action programs to undermine Filipinos' backing for the Huks. With that victory behind him, General Lansdale initially commanded great respect in the 1960's as an adviser to South Vietnamese and United States military leaders, and to Ambassador Henry Cabot Lodge. Early in the war, General Lansdale was considered to be the individual who provided the intellectual direction to the counterinsurgency and nation-building efforts. But he became less significant when the conflict left the counterinsurgency phase and became a more conventional war. Lansdale was no angel. He took an important part in the CIA's "Operation Mongoose" to assassinate Cuban leader Fidel Castro. He strangely went against his own most treasured rules in Vietnam, when he was trying desperately to build support for Diem, by bribing generals of the many sects in Vietnam to bring their men behind Diem. In his own book, he then lied about this, an unpalatable act that was later revealed in the Pentagon Papers. And yet he knew things and he represented ideas and possibilities that were so far beyond the rigid and stratified - and, as it turned out, tragically unsuccessful - military thinking of his time that he remains a lone and original operational giant of modern warfare and America's role in it. As Lansdale moved toward his death in 1987, he tried to call America to the real world of irregular conflict by recalling Continental troops at Valley Forge, officers and men under American guerilla leaders like Marion or Greene. He talked of the motivation of modern insurgent troops, of the use of propaganda. When Richard Nixon, who respected Lansdale, asked him in 1984 for some of his brief thoughts about modern wars, Lansdale wrote that "conventional operations are more apt to widen the problem or to be more cosmetic than a cure." The people were the true battleground of war and "whoever wins them, wins the war." A cultural biography of a legendary Cold War figure; The man widely believed to have been the model for Alden Pyle in Graham Greene's The Quiet American, Edward G. Lansdale (1908-1987) was a Cold War celebrity. A former advertising executive turned undercover CIA agent, he was credited during the 1950s with almost single-handedly preventing a communist takeover of the Philippines and with helping to install Ngo Dinh Diem as president of the American-backed government of South Vietnam. Adding to his notoriety, during the Kennedy administration Lansdale was put in charge of Operation Mongoose, the covert plot to overthrow the government of Cuba's Fidel Castro by assassination or other means. In this book, Jonathan Nashel reexamines Lansdale's role as an agent of American Cold War foreign policy and takes into account both his actual activities and the myths that grew to surround him. In contrast to previous portraits, which tend to depict Lansdale either as the incarnation of U.S. imperialist ambitions or as a farsighted patriot dedicated to the spread of democracy abroad, Nashel offers a more complex and nuanced interpretation. At times we see Lansdale as the arrogant "ugly American," full of confidence that he has every right to make the world in his own image and utterly blind to his own cultural condescension. This is the Lansdale who would use any conceivable gimmick to serve U.S. aims, from rigging elections to sugaring communist gas tanks. Elsewhere, however, he seems genuinely respectful of the cultures he encounters, open to differences and new possibilities, and willing to tailor American interests to Third World needs. Rather than attempting to reconcile these apparently contradictory images of Lansdale, Nashel explores the ways in which they reflected a broader tension within the culture of Cold War America. The result is less a conventional biography than an analysis of the world in which Lansdale operated and the particular historical forces that shaped him - from the imperatives of anticommunist ideology and the assumptions of modernization theory to the techniques of advertising and the insights of anthropology. The authorized biography of Lansdale is Cecil Currey's Edward Lansdale: The Unquiet American, published in 1988. Currey had previously written a book critical of the performance of the U.S. military command in Vietnam, and in it he had quoted approvingly Lansdale's lament that the United States had failed in Vietnam despite its use of "overwhelming amounts of men, money, and material"; the implication was that counterinsurgency, including greater and more sympathetic contact with the Vietnamese people, would have been a better strategy. If not quite hagiographic, Currey's treatment of Lansdale was, as Nashel puts it, "adulatory" (p. 3). (Nashel mentions having found a poignant photograph of Currey pushing a wheelchair-bound Lansdale through Disneyworld late in Lansdale's life.) The other key source on Lansdale was Lansdale himself. His memoir, In the Midst of Wars, was published in 1972. Reviewers at the time pointed out that Lansdale had omitted some salient facts about his career, such as his lengthy employment by the CIA. However, the book was full of stories about Lansdale's exploits in the Philippines and Vietnam, disarmingly modest accounts of how he helped Ramon Magsaysay take charge in the Philippines, how he had tried to put some spine into South Vietnamese leader Ngo Dinh Diem and conducted psychological warfare against Diem's enemies in the North, and, most gleefully, how he had frustrated French authorities in their efforts to keep control of some portion of their Indochina colony during the mid-1950s. The memoir was written in the style of an adventure novel, as Nashel notes. It was skillful most of all in its ability to conceal the truth by dint of its seeming candor: Lansdale made himself sound so mischievous that it was impossible to believe that he was not telling the whole story. Readers charmed by his tales, disarmed by his humor and playfulness and mildly confessional tone, were not likely to ask whether there was anything dirtier he was up to, or to question his assumptions at all. Nashel is hardly unsympathetic to Lansdale, though at times he seems appalled or amused by him. Each of his chapters treats a different facet of Lansdale's identity. Nashel first describes Lansdale as an advertising man, as indeed he was for a time during the 1930s and 1940s. Lansdale wrote ads for food products and blue jeans. He would later advertise democracy and modernity, and use an ad-man's images and slogans to undercut the appeal of the Huks in the Philippines and the Viet Minh in Vietnam. He communicated not only through language but by using gestures, friendly touches, and slaps on the back; he did not speak Tagalog or Vietnamese but never felt burdened by this, for he knew, he said, how to gain a man's confidence by acting confidential. As an advocate for consumerism, Lansdale sold Asians the American dream, or tried to. He was also, of course, a spy. The details of Lansdale's work for the CIA remain classified - when Lansdale's papers appeared at the Hoover Institution in the early 1980s, agents turned up and carted off to Washington all the documents that revealed his connection to the agency - and Lansdale appreciated what Nashel rightly terms "the power of secrets" (p. 77) to manipulate people. Lansdale's loathing of communism and his ad-man's understanding of the importance of communication made him the consummate secret agent, even as he enjoyed pretending that he was no such thing. It is an inescapable fact that from the beginning of the US occupation of Japan, General MacArthur, President Truman, John Foster Dulles, and others, knew all about the stolen treasure in Japan and the continuing extraordinary wealth of the Japanese elite, despite losing the war. In an official report on the occupation prepared by MacArthur’s headquarters and published in 1950, there is a startling admission: “One of the spectacular tasks of the occupation dealt with collecting and putting under guard the great hoards of gold, silver, precious stones, foreign postage stamps, engraving plates, and all currency not legal in Japan. MacArthur’s staff knew, for example, of $2-billion in gold bullion that had been sunk in Tokyo Bay, later recovered. Another great fortune discovered by U.S. intelligence services in 1946 was $13-billion in war loot amassed by underworld godfather Kodama Yoshio who, as a ‘rear admiral’ in the Imperial Navy working with Golden Lily in China and Southeast Asia, was in charge of plundering the Asian underworld and racketeers. He was also in charge of Japan’s wartime drug trade throughout Asia. Kodama specialized in looting platinum for his own hoard. As this was too heavy to airlift to Japan, Kodama also helped himself to the finest gems looted by his men, taking large bags of gems to Japan each time he flew back during the war. After the war, to get out of Sugamo Prison and avoid prosecution for war crimes, Kodama gave over $100-million in US currency to the CIA. He was also, amazingly, put on General Willoughby’s payroll, and remained on the CIA payroll for the rest of his life, among other favors brokering the Lockheed aircraft deal that became a major scandal for Japan’s Liberal Demopcratic Party. Kodama personally financed the creation of the postwar political parties that merged into the Liberal Democratic Party (LDP), strongly backed to this day by Washington. Both Kodama and his underworld associate Sasakawa Ryiochi, were then involved with the CIA in joint recoveries of Japanese war-loot from the Philippines. On September 2, 1945, after receiving official notice of Japan’s surrender, General Yamashita and his staff emerged from their mountain stronghold in the Kiangan Pocket on Luzon, and presented their swords to a group of U.S. Army officers led by Military Police Major A.S. ‘Jack’ Kenworthy, who took them to Bilibad Prison outside Manila. Because of gruesome atrocities committed earlier by Admiral Iwabuchi Kanji’s sailors and marines in the city of Manila (after Yamashita had ordered them to leave the city unharmed), the general was charged with war crimes. During his trial there was no mention of war loot. But there was a hidden agenda. Because it was not possible to torture General Yamashita physically without this becoming evident to his defense attorneys, members of his staff were tortured instead. His driver, Major Kojima Kashii, was given special attention. Since Yamashita had arrived from Manchuria in October 1944 to take over the defense of the Philippines, Kojima had driven him everywhere. In charge of Kojima’s torture was a Filipino-American intelligence officer named Severino Garcia Diaz Santa Romana, a man of many names and personalities, whose friends called him ‘Santy’. He wanted Major Kojima to reveal each place to which he had taken Yamashita, where bullion and other treasure were hidden. Supervising Santy was Captain Edward G. Lansdale, later one of America’s best-known Cold Warriors. In September 1945, Lansdale was 37 years old and utterly insignificant, only an advertising agency copywriter who had spent the war in San Francisco writing propaganda for the 0SS. In September 1945, chance entered Lansdale’s life in a big way when President Truman ordered the OSS to close down. To preserve America’s intelligence assets, and his own personal network, OSS chief Donovan moved personnel to other government or military posts. Captain Lansdale was one of fifty office staff given a chance to transfer to U.S. Army G-2 in the Philippines. There, Lansdale heard about Santy torturing General Yamashita’s driver, and joined the torture sessions as an observer and participant. Early that October, Major Kojima broke down and led Lansdale and Santy to more than a dozen Golden Lily treasure vaults in the mountains north of Manila. While Santy and his teams set to opening the rest of these vaults, Captain Lansdale flew to Tokyo to brief General MacArthur, then on to Washington to brief President Truman. After discussions with his cabinet, Truman decided to proceed with the recovery, but to keep it a state secret. After briefing President Truman and others in Washington, including McCloy, Lovett, and Stimson, Captain Lansdale returned to Tokyo in November 1945 with Robert B. Anderson. General MacArthur then accompanied Anderson and Lansdale on a covert flight to Manila, where they set out for a tour of the vaults Santy already had opened. In them, we were told, Anderson and MacArthur strolled down “row after row of gold bars stacked two meters tall”. From what they saw, it was evident that over a period of 50 years (1895-1945) Japan had looted many billions of dollars in treasure from all over Asia. A far longer period than Germany had to loot Europe. Over five decades, Japan had looted billions of dollars’ worth of gold, platinum, diamonds, and other treasure, from all over East and Southeast Asia. Much of this had reached Japan by sea, or overland from China through Korea. What was seen by Anderson and MacArthur was only some of the gold that had not reached Japan after 1943, when the US submarine blockade of the Home Islands became effective. From this it is obvious that what was looted by Japan on the Asian mainland from 1895-1943 had reached Japan and been tucked away there in what the US Army statement called “undeclared caches of these treasures ... known to exist” . Far from being bankrupted by the war, Japan had been greatly enriched, and -- thanks to Washington’s intervention -- used this treasure to rise like a phoenix from the ashes, while its victims struggled on for decades. The gold recovered in the Philippines was not put in Fort Knox to benefit American citizens. There has been no audit of Ft. Knox since 1950. According to Ray Cline and others, between 1945 and 1947 the gold bullion recovered by Santy and Lansdale was discreetly moved by ship to 176 accounts at banks in 42 countries. The gold was trucked to warehouses at the U.S. Navy base in Subic Bay, or the U.S. Air Force base at Clark Field. Preference went to the U.S. Navy because of the weight of the bullion. Secrecy was vital. If the recovery of a huge mass of stolen gold became known, the market price of gold would plummet, and thousands of people would come forward to claim it, and Washington would be bogged down resolving ownership. The secrecy surrounding these recoveries was total. Robert Anderson and CIA agent Paul Helliwell traveled all over the planet, setting up these black gold accounts, providing money for political action funds throughout the noncommunist world. In 1953, to reward him, President Eisenhower nominated Anderson to a Cabinet post as secretary of the Navy. The following year he rose to deputy secretary of Defense. During the second Eisenhower Administration, he became secretary of the Treasury, serving from 1957 to 1961. After that, Anderson resumed private life, but remained intimately involved with the CIA’s worldwide network of “black banks”, set up by Paul Helliwell. Eventually, this led to Anderson being involved in the scandal of BCCI, the Bank of Credit and Commerce International, a Pakistani bank with CIA ties. No one made better use of the recoveries than Lansdale. For his role in enabling the Black Eagle Trust, Lansdale became the darling of the Dulles brothers and their Georgetown coven, which included key officials in the CIA during the years it was run by Allen Dulles. Writing to the U.S. Ambassador in Manila, Admiral Raymond Spruance, Allen Dulles called Lansdale “our mutual friend”. In the early 1950s, Allen Dulles gave Lansdale $5-million to finance CIA operations against the Huks, rural peasant farmers fighting for land-reform in the Philippines. When he sent Lansdale to Vietnam in 1954, Dulles told Eisenhower he was sending one of his “best men”. In the late 1950s, he was in and out of Tokyo on secret missions with a hand-picked team of Filipino assassins, assassinating leftists, liberals and progressives. Lansdale was also close to Richard Nixon, and headed efforts to assassinate Cuba’s Fidel Castro. Without exception, Lansdale’s Asian adventures were costly failures. But Washington’s effort to boost the LDP in Japan was a big success. Perhaps the most remarkable instance of cooperation between Lansdale and the American Friends of Vietnam involved a third party: movie director, producer, and screenwriter Joseph L. Mankiewicz. Early in 1956 Mankiewicz, whose filmography included such popular and critical successes as The Philadelphia Story and All About Eve, visited Saigon to research locations for a cinematic version of Greene's The Quiet American. During this trip, he met both with staff of the International Rescue Committee's Vietnam office and Lansdale himself, who followed up the encounter with a long letter offering various pieces of advice about the project, chief of which was the suggestion that Mankiewicz depict an incident portrayed in Greene's novel, the bombing of a Saigon square in 1952 by a Vietnamese associate of Lansdale's, General Trinh Minh The (and attributed by Greene to the baleful influence of the American, Pyle), as "actually having been a Communist action." On his return home, Mankiewicz contacted the chair of the AFV, Iron Mike O'Daniel, telling him that he intended "completely chang[ing] the anti-American attitude" of Greene's book. The U.S. ambassador to South Vietnam, Frederick Reinhardt, was sympathetic but skeptical, telling the American Friends of Vietnam's Executive Committee: "If (the book) were to be edited into a state of complete unobjectionahleness, there might be nothing left but the title and scenery." This is, however, precisely what Mankiewicz proceeded to do, turning the American character into his hero and portraying Greene's fictional alter ego and Pyle's nemesis, the English journalist Fowler, as a communist stooge. Not only that, in an astonishing piece of casting apparently suggested by O'Daniel, the part of Pyle - in Greene's novel, a callow Ivy League hrahmin - was given to the World War ll hero Audie Murphy, a fine soldier but limited actor, who reportedly distressed his English costar, Michael Redgrave, by storing a .45 and 500 rounds of ammunition in his Saigon hotel room to protect himself from Vietminh agents. "I figured if they were going to get me," he explained, "I'd give them a good fight first." The resulting movie was a travesty of Greene's book, but Lansdale was delighted. After a premiere at Washington's Playhouse Theater, the proceeds of which were donated to the AFV, the spy wrote his friend Diem describing "Mr. Mankiewicz's 'treatment' of the story" as "an excellent change from Mr. Greene's novel of despair," and suggesting "that it will help win more friends for you and Vietnam in any places in the world where it is shown." It was a brilliantly devious maneuver of postmodern literary complexity: by helping to rewrite a story featuring a character reputedly based on himself, Lansdale had transformed an anti-American tract into a cinematic apology for U.S. policy - and his own actions-in Vietnam. Greene himself was understandably furious. "Far was it from my mind, when I wrote The Quiet American," the Englishman raged, "that the book would become a source of spiritual profit to one of the most corrupt governments in Southeast Asia."